Fire can be a wonderful thing, you just ask the cavemen! Those flickering orange flames aren’t so great when they’re emitting from your smartphone, though. That’s even more true when those flames begin to engulf an iPhone that is plugged into an electrical source. Unfortunately, it appears that our recent report of an iPhone catching fire on an internal Australian flight may not be an isolated incident, with news that a similar iPhone 4 also set itself alight when on charge overnight at a Brazilian residence. The iPhone in question was on charge just a foot from its owner’s face when it apparently began to smoulder, a sure sign that something isn’t right if you ask us! This isn’t the first time an iPhone has found itself a little warmer than Apple intended. 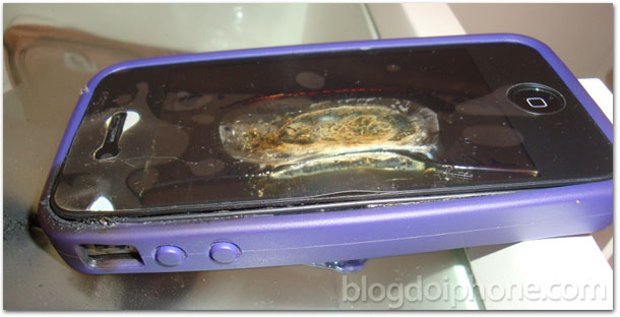 Earlier this week we told you about an iPhone 4 reportedly emitting black smoke during a flight in Australia. With the plane safely on the ground safety officers are now trying to work out what the catalyst could be for an expensive, premium smartphone spontaneously self-combusting. Apple has not yet commented either the incident in Australia, or the one in Brazil which happened when the handset was on charge. With millions of iPhones being left plugged into the wall overnight, let’s hope that charging is not a catalyst for the overheating that apparently caused these two fires. At the moment all possibilities are merely speculative, but the finger is being squarely pointed at the batteries used in Apple’s iPhones. If you own an iPhone and charge it regularly, chances are you’ve noticed yourself how toasty your handset can get. The iPhone 4S even gets quite warm during seemingly trivial tasks, and we’re blaming iOS 5. Whether the two troublesome handsets to be set alight were running iOS 5, we’re not sure, but an increase in heat would match the decrease in battery life that many are experiencing.